There are days when you need to take comfort in the simple things. In what is reliably true, every time. There’s a certain joy in what is within your control, giving satisfaction time and again. Also, there is a particular delight to be had in the smallest of pleasant surprises. That a giant homewares warehouse sale will result in major retail therapy and bags full of exciting new kitchen toys is a fact that is universally accepted. I am now the proud owner of a hand cranked nut grinder which, to be completely honest would redeem itself on its’ looks alone even if it turned out to be another useless gadget. That a discovery of a coffee cart on a morning walk makes said walk so much more satisfying is another irrefutable fact. Oh and ducklings…..I defy anyone to find me a cuter baby animal than a fluffy duckling. That perfectly poached eggs atop anything makes a super satisfying meal is something that I prove again and again. 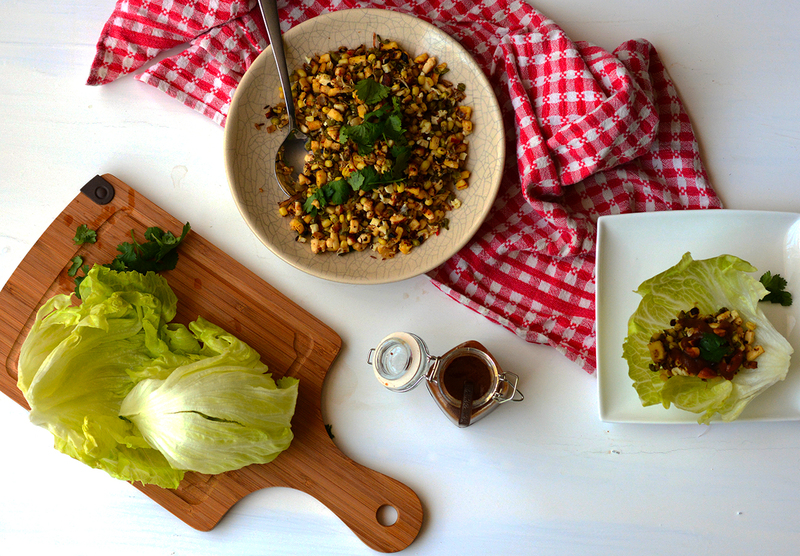 And anything spicy wrapped in a lettuce leaf automatically becomes not only refreshing but also good for you. This has all the elements of a good San Choi Bau, Indian style. Theres a hot, spicy, filling, a flavoursome sauce and a respectable crunch. And that lettuce leaf envelope that just freshens up those warm Indian flavours. The Chinese version uses pork mince but I have opted for a vegetarian variation which I think is just as satisfying. You can get tamarind sauce in bottles from Indian grocery stores, or make it yourself using the method below. To make the sauce, soak the tamarind in the boiling water for about 20 mins. Use this time to prepare all the ingredients for the filling. Once the water has cooled to a lukewarm temperature, squelch the tamarind repeatedly in the water using clean hands. The water should thicken and obtain the colour of the tamarind. Strain, reserve the liquid and discard the tamarind (alternatively, the tamarind can be reused in dishes like this salad or this plantain stir fry). 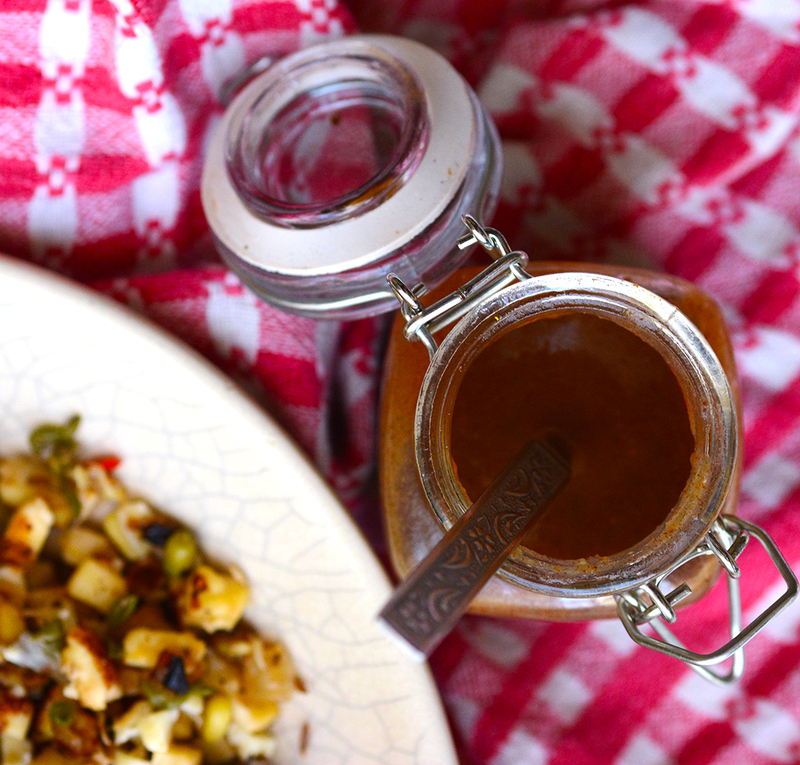 In a small saucepan, place the tamarind water and the other tamarind sauce ingredients. Boil for about 10 mins or until the dates are mushy. Allow to cool, remove the dried chillies, and blitz in the food processor until it is a smooth sauce like consistency. You will probably need to add more water (at room temp)- I ended up adding about 1/3 cup. In a non-stick fry pan, heat the oil and temper the cumin seeds. Fry the garlic, ginger and chopped chilly until slightly browned. Add the onion and fry until slightly tender. Add the paneer, mung beans and salt and toss to mix well. Cook for a couple of mins until the paneer is tender. In another small pan, heat the ghee or butter and roast the cashews until browned. 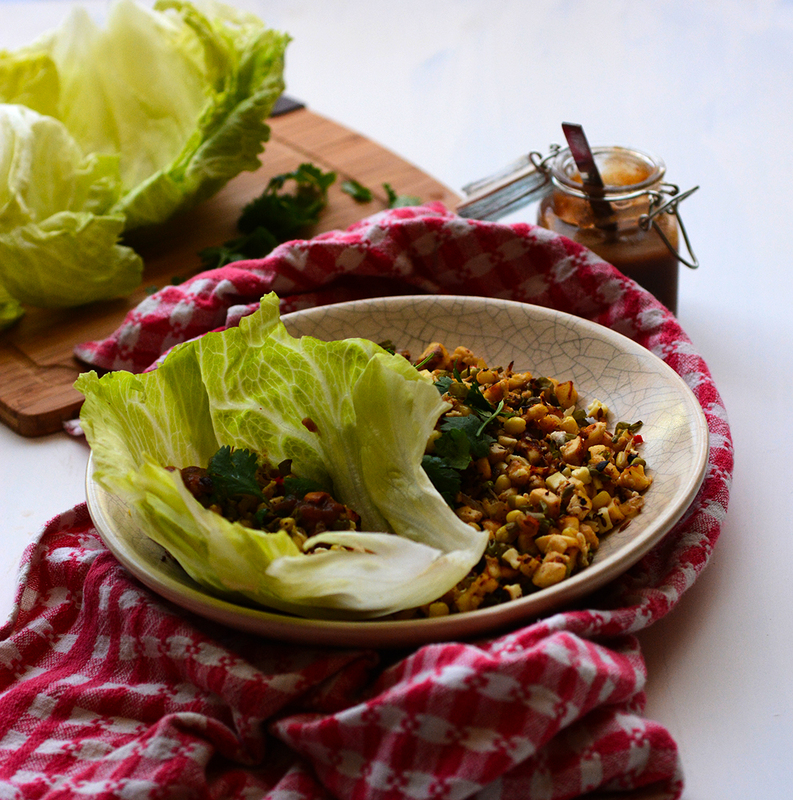 To serve, place a spoonful of the filling in the centre of a lettuce leaf, drizzle with a generous amount of sauce and sprinkle with cashews and coriander. Eat like a taco! Paneer is an Indian cottage cheese. While I usually prefer the frozen cubes, in this case I think a block works better as it is easier to dice. Paneer, dried red chillies and kala namak are available at Indian grocery stores. Deeps, looks divine. Cant wait to try. Regarding teh mung beans – they dont need to be boiled/pressure cooked? Just stirfrying them is enough? Thanks hun. I use the sprouted mung beans that you buy in tubs here, not the dry ones. I think maybe you can sprout the dry ones by soaking them? Thanks Sara! It is a lovely combo. oooh yummo i love a twist on the normal sang choy baos! Indian Tapas! I love it. Such a great fusion recipe that I think I’ll have to try soon. Brilliant! Do let me know how you go…..